I was blessed to have grown up in a family with multiple generations of grandparents. My great-great-grandma Clara was 98 when she went to be with the Lord seven years ago. My great-grandma Lillie departed from us just two years ago. With her passing a great big gaping hole was left in our family. My grandma Lillie was a constant in my early life. She would come and spend weeks at a time with us and she would share a room with me while she was visiting. During those times she taught me so many things. She was very Southern, so manners, cooking, reading, singing old hymns at the piano, and telling stories were her legacy to all of us. One of my favorite things to do is watch the old videos we have of her telling some zany family story. Her animated gestures and exaggerated emotions still bring a smile to my face. My siblings and I are all now married and have begun families of our own. I’m sad that my children will only know my grandma Lillie through videos and my recollections. But what I realized the other day was that it is now my parents that are in charge of passing on our family legacy. These two that loved and raised my brothers and I and taught us to love Jesus are now coming alongside us to help raise our children. The grandparents’ role is that of the legacy keeper. Parents have their hands full with the day to day care of making sure everyone is clothed, fed and bills are paid. I love that when my kids have driven me to the brink of insanity my parents can step in and impart truth either in person or via Skype. Grandparents just have a special place in their hearts for their grandkids. I have noticed too that if granny or poppy say something they listen. Grandparents offer them a constant stability in their lives but the most important thing that they offer them is a spiritual legacy. One of the ways that my parents do this for my children is to send them packages with handwritten notes and resources that will guide them in their walk with Christ. My mom loves to pick out great books and videos with truth deeply knitted into the story. 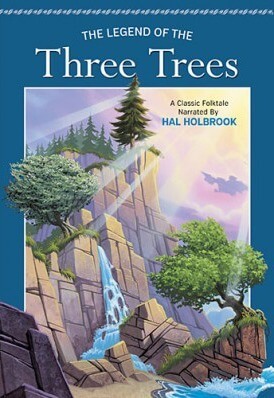 On a recent visit to my parents’ house my mom popped in the DVD, The Legend of the Three Trees. Kids can relate to this story of what you want to be when you grow up. Each tree thinks they know what they want to be when they grow up, but really God has a plan for each one that is far more than any of them could have imagined! The best part was listening to the kids talk to their granny about what they will grow up to be. Of course this changes each time she sees them but what I love most is how she whispers in their little ears that no matter what they decide if they put Christ first it will be far greater than anything they could do on their own. I thank God daily for those that have gone before me and those that are to come. May this family legacy of Christ followers continue from generation to generation. May each successive grandparent pass on to their beloved grands their love for the One who is the ultimate family legacy builder. Without His story in our lives the rest would be just empty tales of past generations. But through Him our family story can literally go on throughout eternity. How do you tell stories in your family? In what ways do you pass on your family’s legacy? This post originally appeared on Faithgateway. 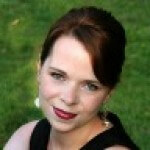 Whitney Lett: Whitney Lett’s motto is ‘Why Be Quiet When You Can Talk’. She’s busy living happily ever after with her beloved husband Sam and their two boys. She spends her days going from one adventure to another. Her nights are spent blogging at Rambles of a SAHM. She believes that it is her responsibility to give to others just as Christ has given to her. 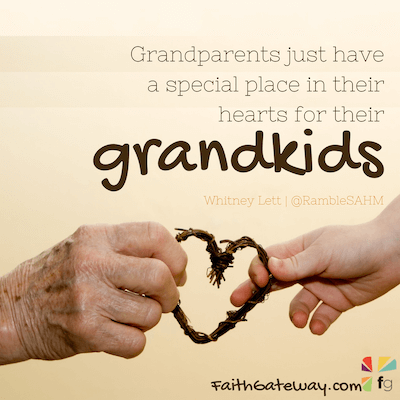 This entry was posted in Blog and tagged Family, Grandparent, Kids, Legacy, Parenting by Whitney Lett. Bookmark the permalink.